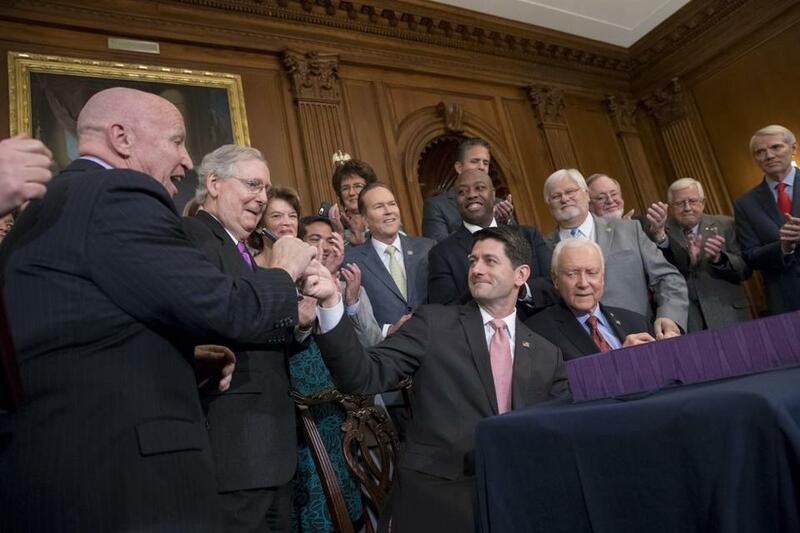 Speaker of the House Paul Ryan (center) with Senate Finance Committee Chairman Orrin Hatch presented a pen to House Ways and Means Committee Chairman Kevin Brady after signing the final version of the GOP tax bill during an enrollment ceremony at the Capitol in Washington on Thursday. But supporters of the mandate in Massachusetts are not celebrating. They’re concerned that some consumers in this state may drop coverage after seeing headlines about the unraveling of the national mandate and mistakenly believing that it applies to Massachusetts. Language put into the tax bill late in the process clearly benefits President Trump’s vast real estate empire, and gives him a large tax break. The concept of mandating insurance coverage has bipartisan support in Massachusetts, but national Republicans view the requirement as an unfair penalty that forced many Americans to buy a product they did not want. 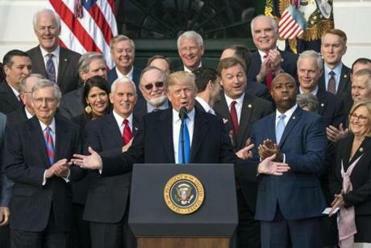 The Congressional Budget Office estimates that repealing the national mandate will lead to higher premiums as well as 13 million fewer people with coverage over the next 10 years. Some specialists expect the coverage losses won’t be so high. Massachusetts, in 2006, was the first state to pass a law mandating universal health coverage, under then-governor Mitt Romney, a Republican. The idea behind the mandate is that insurance markets need a mix of healthy and sick people to spread the costs of care. More than 97 percent of Bay State residents have health insurance, according to the US Census Bureau — the highest rate of insurance in the country. Consumers buying insurance on the state’s insurance exchange, called the Massachusetts Health Connector, have until Saturday to select a plan to go into effect in January. They have until Jan. 23 to select coverage that begins in February. Most Massachusetts residents don’t buy plans on the Connector and get insurance through their employers instead. The deadlines to sign up for employer coverage vary. About 50,000 state residents are subject to a penalty every year because they don’t have health insurance, according to Connector officials. The maximum penalty for these people in Massachusetts is $1,152 per year. Audrey Gasteier, chief of policy and strategy at the Connector, said officials at the state agency will monitor how the federal tax law affects insurance coverage and help inform consumers that the mandate to obtain insurance still exists in Massachusetts. “It’s easy to imagine that consumers could get confused about national news they’re hearing about the mandate going away,” she said. The Connector is spending $1.1 million on advertising this year to encourage consumers to sign up for health coverage. In addition, it is spending $1.6 million to employ workers who help consumers enroll in health plans. A group that represents health insurers — which gained new customers from the state and federal insurance mandates — said Wednesday that Massachusetts officials should do more to remind consumers about the insurance rules here.